Offering you a complete choice of products which include paper mill dryer section. 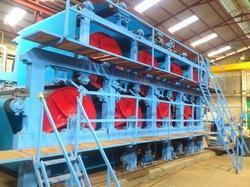 Our range of Paper Mill Dryer Section is widely appreciated throughout the India due to salient attributes. They are safe to use and give a pleasant working experience to the user. Our products range including Paper Mill Dryer Section is rendered with the help of our experienced technocrats and expert team members. We have been able to carve a niche in this highly competitive market within a very short span of time. Looking for Paper Mill Dryer Section ?